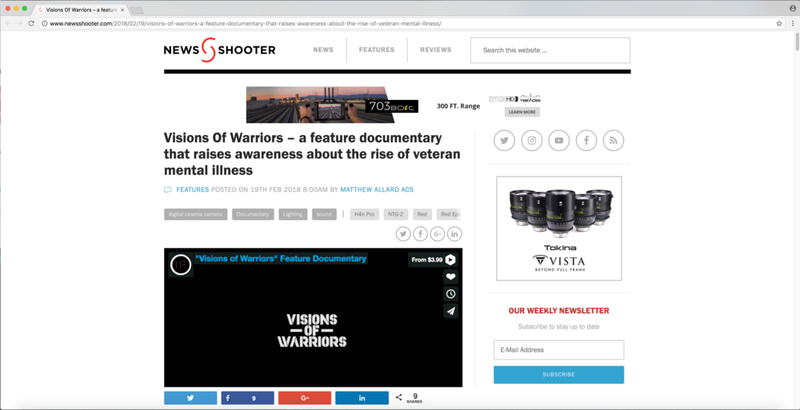 “Visions of Warriors” is covered in Feature Shoot, one of our favorite photography sites. According to the site, “Feature Shoot showcases the work of international emerging and established photographers who are transforming the medium through compelling, cutting-edge projects.” We’re so honored to be part of this great site. We’re always inspired by all the amazing photography and the talented photographers behind it. Our documentary is not only meant to raise awareness about the rise of veteran mental illness and the power of innovative photography therapy to treat it, it’s also a love letter to the art of photography, which has given us so much. Thank you to Ellyn Kail, Alison Zavos, and Feature Shoot for this incredible honor.